By mid-afternoon on the last day in April, a bus coming from Reno, another one from Las Vegas and a slew of passenger cars coming from every which way had all accomplished the voyage to Ely. It was Rural Round Up, and proved to have the largest attendance of any in the event’s history, 279 registered attendees by the time it was over. At three o’clock on Wednesday afternoon the Round Up was just beginning, with a tour of Renaissance Village, a project of the Ely Renaissance Society which has also sponsored the murals around the city and repurposed the old Ely Bank building on the corner of 4th and Aultman as a gallery and exhibit space. The village is a small collection of small houses on Ely’s northwest side that have been rescued, restored and fitted out with the relics from various different ethnic traditions represented in the little city: Greek, Spanish, English, French, Slavic, Italian, Asian. . . .
Those of us riding the train became an ad hoc jury, given paper ‘ballots’ with the names and scurrilous nicknames of the suspects and asked to pick one as the perp. Very hard choice for me because of my intimate knowledge of these malefactors. Which of them is immune from the urge to kill? None of them, in my opinion, so I settled on the most obvious and popular candidate, Loathsome Loquacious, and resumed my appreciative oculation of the landscape rolling slowly by. stopping at a small ‘settlement’ of facades made for a very, very low-budget movie and dominated by a sturdy gallows with a dangling noose. Men and women on horseback appeared, armed to the teeth. A hubbub of shouting erupted from the observation car. I was trapped in a coach with sticky windows and couldn’t see much of what happened, but fortunately Phil Hermanson, a cinematographer from Utah was present. He filmed and edited the entire dramatic episode for our delectation, and here it is. Don’t miss it! The Crime of the Century and its extraordinary solution! Larry Friedman and Don Newman vie for Best Actor! 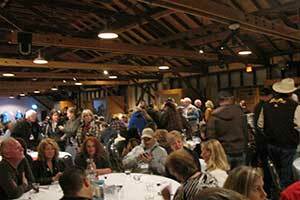 The NNRy Freight Barn was crowded that evening, the barbecue was scrumptious and the music, heard over the happy babble of the delegates, set toes tapping throughout the building. On Thursday the speakers, session presenters and NCOT staffers provided a busy and instructive day, beginning with Executive Director Claudia Vecchio presenting an overview of current NCOT activities and ended with a wine tasting from Pahrump’s Sanders Family Winery. We brought Shorty, along with some of his books to give away, and he made friends with half the women who came through the door with just a wag of his tail. Men like him too, but they don’t get down and cuddle the way the ladies do. The Awards Dinner was an expected tour-de-force from Larry Friedman, an unexpectedly emotional farewell from termed-out Lt Governor Brian Krolicki, and the recognition of tourism heroes from each Territory around the state. Friday’s main event was a tour of Lehman Caves at Great Basin National Park, and while a busload of folks headed off for that, I joined a group of local volunteers making up monthly food packages for needy school kids. For me it was the single most gratifying experience of the three days, and there were five or six of us from the Round Up pitching in. And then it was over, and we were off to Wells. 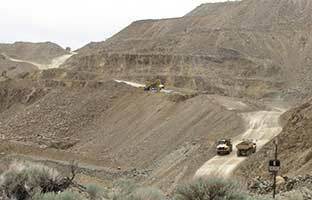 The heavily trafficked Lucerne Pit on April 25, 2014 as CMI ransacks the canyon in hopes of satisfying its investors. activity is taking place in and around the Lucerne Pit right beside the highway, it’s easy to surmise that the shovels are so busily taking overburden off a trove or two of rich ore in order to maintain the high returns. 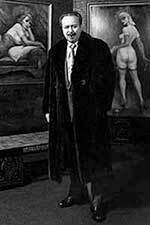 Didn’t CEO Corrado De Gasperis promise profit in the second quarter? Was Dave Thomas fired — by John V. Winfield himself as we are told, he of the power-wagging finger — for objecting to this disruption of the established mining plan? More questions about CMI than answers, or in other words, status quo. Also a complaint has been filed with the Ethics Commission about Lyon County Commissioner Vida Keller’s unseemly relationship with CMI. BULLETIN: CMI released its first quarter results: a loss of $3.8 million. Cash and cash equivalents on hand at December 31, 2013 totaled $2.4 million. Then on February 12, 2014 company took a $4.6 million loan. 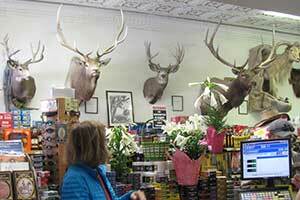 Cash and cash equivalents on hand at March 31, 2014 totaled $2.6 million. Thus CMI spent $4.4 million in three months and should only have $1.2 million at the end of April. Another zero added to the string and running out of money again. What next? Fernley Art project — Burning Man has had an enormous effect on the psychic terrain of Northern Nevada and is now on the verge of having even more. 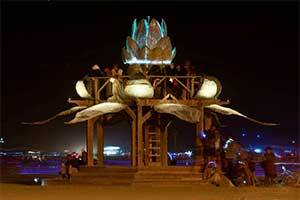 Burning Man have also established the Black Rock Arts Foundation (BRAF) as an extension of the annual arts festival, “to bring creation and coexistence with art to the rest of the world”. The foundation received its 501(c)3 status in November of 2001. The Art Park site, across the highway from City Hall. Grinberg and Rockspinner 6 by Zachary Coffin) for temporary installation in a new city-owned park in Fernley in late spring of 2014. In the second phase, the City and BRAF selected Fernley artist Pan Pantoja, who will collaborate with local residents to create an original public artwork reflecting “Fernley’s character, heritage, and culture”. discarded bottlecaps into a beautiful and inviting structure. These seemingly dull and useless objects become a glamorous canopy of flowers. Rockspinner 6 (shown above) Known for his incredible large-scale stone sculptures, artist Zach Coffin’s massive nine-ton stone slab rotates on an axis that is engineered to spin with ease, so that even a child may set the piece in motion. 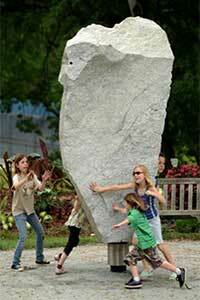 The sight of the massive stone makes us think it’s an immovable mass, and surprises us with its easy spin. Rumors have been flying up and down the Loneliest Highway that Raine’s Market was about to be shut down by the State Health Department because of the taxidermy which provides the unusual decor (click the link to enjoy their website, just as wonderful as the store itself). Raine is purchasing a large property from the county a short distance out of town to the north where he intends to build a new store. The present store is in a line of old structures on the east side of Main Street and presents other drawbacks besides the new regulations, including limited parking and high maintenance costs. What They’re Saying About Us: Vegas glitz masks impending drought ‘catastrophe’ Brief notes from beyond the Mountains: Some of the biggest names in the Cowboy Poetry and Music business are appearing at the Genoa Cowboy Festival May 2-5 in Genoa. Paul Zarzyski and Dave Stamey are enough to pull me in, and then add Mary Kaye, Mike Beck and almost a dozen more and it’s an all-star cast! And did I mention Richard Elloyan from Dayton and Dave Bourne, from the Gem Saloon in ‘Deadwood’? (by which I mean the tv show, not the city in North Dakota) . . .
Sunday May 10 & 11, with booths open from 10 am – 5 pm both days. On May 1-3 DuBois’ Health Food Center and Herb Shoppe in Carson City is hosting a celebration after 50 years of health and business. There will be, door prizes, an art show and sale by local artist Robin Travis, music, and more. 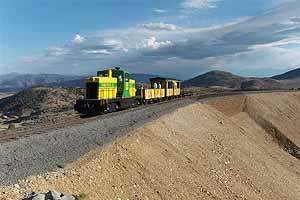 Also, the Virginia and Truckee Railroad season begins with the annual Mother’s Day train from Carson City to Virginia City May on Sunday, May 11. The Mother’s Day train features a 1953 American Locomotive Company (ALCO) heritage diesel locomotive leading 100-year-old Pullman coaches displaying the distinctive yellow and green of the V&T. Tickets ($41 for adults, $25 for children ages 3 to 16, and $38 for seniors and veterans) are available online or call 877-724-5007. 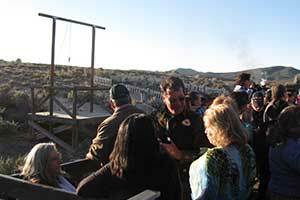 The train departs from the Carson City Depot at 10 am . 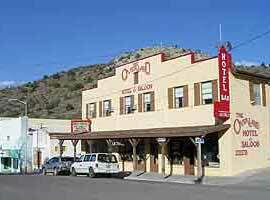 . . Nevada writers: Emma Cline, of Tonopah‘s Mizpah Hotel Cline family, has a story “Marion” in the Paris Review. Mike Makley was interviewed recently on C-Span about his new biography of William Sharon. 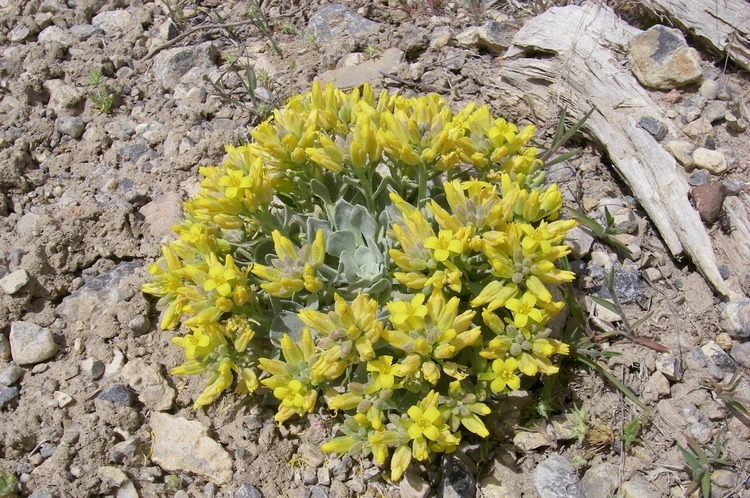 Johnny Gunn is one of the bloggers featured under Other Nevada Voices on our News page, and he has just published another in his series of stories about Simon Sol Dorsey, PI, called “Big Jake Takes A Dive”. Clever chap, that Dorsey . . . The Las Vegas Convention and Visitors Authority reports that 3.7 million people came to town last month, up 4.3 percent from March 2013 and more than in any other month in its history . . . 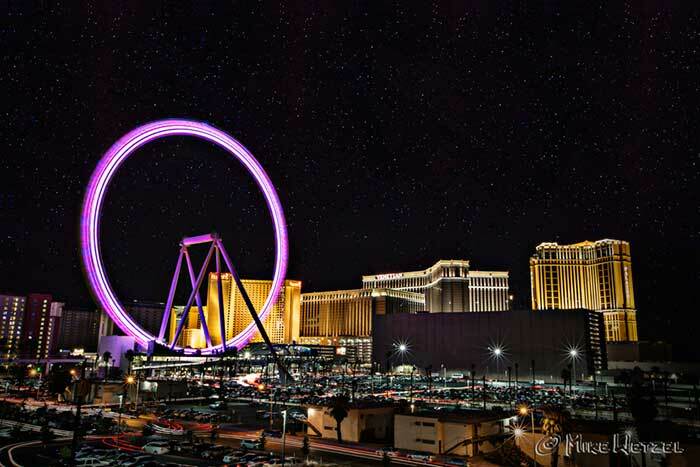 The tallest Ferris Wheel in the world, the High Roller Las Vegas, is now rolling (see the Parting Shot photo below) . 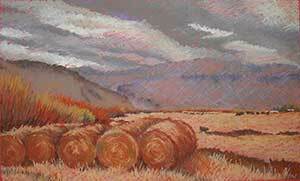 . .
Pioche was discovered in the 1990s by a wave of explorers from Las Vegas. These pioneers had found a treasure, this down-at-the-heels old mining city with the flamboyant past. They bought empty and struggling stores on Main Street, cleaned them, painted them and put bright new businesses in them. And then they slowly starved to death waiting for customers to appear. 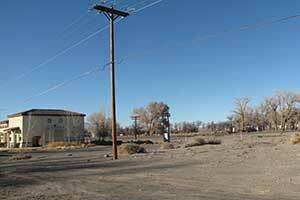 Despite being only three hours from Las Vegas and located in a region of state parks and splendid landscapes, Pioche isn’t overflowing with visitors. How can this be? 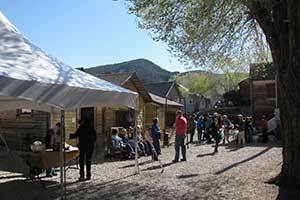 You can learn how to make adobe bricks at the historic Old Mormon Fort State Park at noon on May 17th, one of the Saturdays in May programs . . . A team of students from the Academy of Arts, Careers and Technology in Reno returned home victorious after competing in the first annual NASA Human Exploration Rover Challenge at the U.S. Space & Rocket Center in Huntsville, Ala. The Reno students’ team and their sophisticated rover vehicle won top honors, finishing first among nearly 100 high school and university teams from around the world. Virginia City placed ninth among High Schools . . . 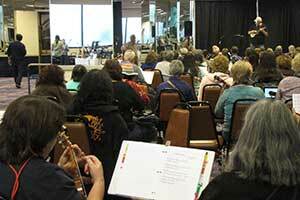 The 6th Annual Ukulele Fest ival took place at the Sparks Nugget last month, the only such musical conclave that doesn’t play Hawai’ian. It’s a major event on the Nevada calendar now. Neil Kornze, who grew up in Elko, has been confirmed as National BLM Director. The BLM oversees 48 million acres of public lands in Nevada, including Cliven Bundy’s grazing acreage, and some 245 million acres nationwide . . . Film, Art, Wine, & Music Festival in Pahrump from Wednesday May 21 – Sunday, May 25 as the Pahrump Arts Council hosts the 19th Art and Sol in the Desert, now including the High Desert International Film Festival, now in its 9th consecutive year. 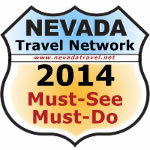 This joint event will be held at the Pahrump Nugget on Memorial Day weekend, May 22-25, 2014. Inside, the event includes nightly international & domestic films, writing competitions, Q & A with filmmakers and superb red carpet events. Outside there will be a daily Street Faire with music, displays and arts and crafts and great food . . .